Steve DeLay from TheUltimateToolkit.com chats with Sean Callanan about his experience in sales & ticketing and how to fill every seat in the stadium. Steve DeLay on playing high school hoops getting his start in sports business. What NBA, NHL & MLB have in common in ticketing. Sport is about entertainment. Sport is about smart intelligent marketing showcasing that fans can have a great experience at your games and selling them the product they want. 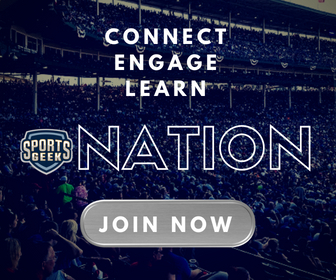 Join Sports Geek Nation to connect with sports business executives across the world. Steve excited to run the Las Vegas Marathon. Congrats! Still great looking attendance in Macon Bacon matches. Every seat in the house! The Macon Baseball fans know how to party. The April Sports Geek Nation Ask Me Anything schedule has been released. Taking the Sports Geek Nation AMA stage this week is Edward Ernst from Breeders’ Cup will be answering your questions in the #ama channel in the Sports Geek Nation Slack. Edward spent most of his career in the market intelligence arena working with B2B and B2C executives to define strategies for future growth. He has worked on the business development side for Hanover Research, HelloSponsor, Emerging Strategy and JJA Search. In 2018, Edward joined Breeder’s Cup where he works on developing new sponsors and establishing corporate partnerships. I thought I had an okay core of knowledge in digital, until I started listening to this podcast. I'm learning so much from Sean and his guests, while being entertained. Outstanding.